As tax season comes to a close, and the snow melts to reveal signs of life, we tend to get spring fever. We start planning to deep clean the house, fertilize the lawn, and move our sweaters to the basement to make way for shorts and swimsuits. If we spend the spring season cleaning our homes and tidying our lawns, we’ll have more time for summer barbeques and pool parties. Wouldn’t it feel good to start the summer months with a clean desk and laptop too? If we set aside some time for cleaning our businesses each spring, then we just might set ourselves up for a guilt-free summer of extended lunches, working from our backyards, and leaving the office early to catch summer baseball games. 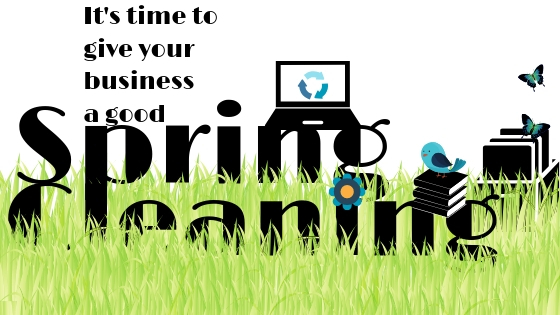 Here are 10 ways to spring clean your business now so you have more time to enjoy summer later. Start the season by surveying your customers and/or employees. Of course, you have to be open to receiving constructive criticism, but you can’t fix yourself or your business if you don’t know it’s broken. Keep the surveys simple so the answers lead towards organizational solutions. For example, ask your clients if they prefer your email blasts or your monthly mailings. You might be able to eliminate one or the other, cleaning up your schedule. Ask your employees if they see any room for organizational improvement. They might all agree that a community wipe board would be helpful for organizing duties in place of the never-ending group email thread. Besides, when people feel like their opinions matter, they feel valuable to you. If tax time gave you a headache, then maybe it’s time to give your accounting practices a good cleaning! Set yourself and your business up for success by taking a look at which folders and files are still relevant, which ones need to be sub-divided, and which can be combined or eliminated. Make folders ahead of time for the entire year and set aside a couple of hours a month to sort that enormous stack of invoices, receipts, and bank statements. If you surveyed your customers, and the majority agreed that your website would be more user-friendly if you re-categorized it, then take some time to actually re-categorize it. Everyone will appreciate that you took their advice to make the change and in most cases, a well-designed, user-friendly website has more traffic which means more sales. Make a calendar with all of the year’s holidays and observances. And don’t forget the all-important National Nurses Day and National Pizza Pie Day! Those days might not mean much to you, but if they start landing you sales at the local hospital and pizzeria, then they just might! In order to be everyone’s holiday hero, you’ll need to be proactive. Approach the businesses far in advance, to give them plenty of time to order promotional products in time to honor and celebrate their quirky observances. Since most people don’t think to recognize these days until they hear them on the radio the day of, you’ll be their Superstar Salesperson who’s always ahead of the game, and looking out for their best interest. Tax time is a perfect time to purge since most of us have already taken the information on all that paper and put it into some sort of spreadsheet for Uncle Sam. So unless it’s a certified copy, scan it, toss it, or both! Do you really need to keep last May’s phone bill? If your phone’s still ringing, then they’ve probably received the payment. Recycle that phone bill into paper straws and save some seals already! Categorize your emails by contacts, subjects, or even dates. It will be far less stressful to start the day off looking at 20 emails instead of 988! And while you’re sorting emails, sort and clean out your contacts. You don’t necessarily need to delete contacts, but you do need to keep them organized and up to date. It’s so simple to drag and drop and sync and delete these days. Don’t procrastinate. Clean it up! You’ll be glad you did when you’re trying to do business from your boat this summer and the contact you need is actually available in your phone or laptop and not on a piece of paper on your desk. If you’re absolutely bombarded with junk emails about subscriptions and deals of the day, then take 10 minutes to unsubscribe! That will save at least 5 minutes a day of deleting them. It will also eliminate the annoying little alert chimes that you receive on your phone all day long, and in the middle of the night too! Take a look at the documents you use most frequently and get them updated, then keep them updated! Make it a monthly goal to update documents. And while you’re at it, does the same outdated document live on your desktop as well as multiple files? Update one, include the date in the file name and save it one location that makes sense. Delete the rest! Whether you’re old school and keeping paper copies in a filing cabinet, or tech savvy and keeping everything on a cloud or a hard drive, clean it up! If you’re spending money on a landline that you don’t even know the phone number to, and you’re paying for magazine subscriptions that land in the recycling bin before they land on your desk, then it’s time to eliminate those monthly expenses. Are you paying for cable at the office to keep informed of national news that you end up watching on your laptop? Are your utility bills out of control because you’re paying to heat and cool office furniture when you’re not there? Maybe it’s time to invest in a programmable thermostat. This small investment could save you hundreds of dollars in unnecessary utility bills over just a couple of years. If you have literally 10 post-it notes staring at you right now that are covered in password chicken scratch, then it’s time to give your passwords some attention. Whether you purchase a password book, put them in your phone, or start an excel spreadsheet, it will save you time to have them all together and organized in one central location. After all, you just might need those usernames and logins when you’re working poolside this July! Just as we allocate time to keep our houses maintained between spring cleanings, it’s important to keep our businesses organized between tax filings. Sticky notes were designed to be temporary. If we have passwords, contacts, and reminders blanketing our desks, it’s time to take them down! Blanket season is over people! It’s time to spring clean!